Serendipity Reviews: Dear Bully - 70 authors tell their stories. 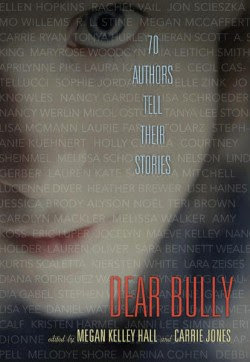 Dear Bully - 70 authors tell their stories. I know bullying. Personally and through my children. In elementary school, I was smart. Sort of pretty. A talented equestrian, singer, dancer, and creative writer. I was also chubby. Not obese. Not even fat, really. But not a skinny jeans kind of girl. You know, the kid who other kids called 'Elsie the cow.' Luckily I was strong - the kid who let insults roll off because she knew in her heart she was destined to do great things. This is one of those books that will remind you of your past. It will bring back all the incidents that you recall that affected your enjoyment of school as a child. If you were one of the lucky few who never experienced any form of bullying at school, then I am pleased for you, because you are a rarity. According to the statistics at the front of the book, a child is bullied every seven minutes on a school playground with 85% of those going without any intervention from an adult. That is a huge amount of suffering and is something that needs to be tackled worldwide. For me, this book couldn't have been read at a more apt time. Both of my daughters who recently started secondary school have experienced situations that I would define as bullying this week. Luckily my girls find they can talk to me and I have been able to guide them through the situations as well as make sure the school is fully aware and is paying attention. However, not every child is willing to talk so openly about bullying with an adult or a peer and that is where this book needs to come in. This is the type of the book that should be on every school book shelf. The book is made up of over 70 different stories written by American Young Adult authors and deal with how either they or members of their family have dealt with bullying. The book is separated into sections which deal with different elements of bullying. There are sections where the authors reflect; where the praise the friends who stood by them as well as a section on survival and how things got better. I wanted to pick out a few of the stories which really stood out for me. Dear Samantha by Kieran Scott. - Kieran Scott writes a letter to the bully from her year who managed to control so many people's lives. She tries to work out how she managed to have so much control, but then explains how it made her stronger as a person as she grow up. I loved that this story showed how she overcame the situation and moved on. There's A Light by Saundra Mitchell - this brought tears to my eyes. She recalls how close she came to giving up her life because of the torment she faced over head lice. She was one of the lucky ones who was saved, as the statistics say that a child commits suicide as a result of being bullied every half an hour. Frenemies Are Not Enemies by Michelle Zink - from this story I took inspiration and guidance on how to help my own children. Michelle talks about how her daughter's decision to change her appearance affected her friendships and became a victim. Michelle showed her out to make new friends with people who were similar to her. I really did find this story such a true inspiration. Finding Light In The Darkness by Lisa Shroeder - I love the way Lisa Shroeder writes as all her stories are written in verse. I find that the words seem to sink in more and affect my feelings at a greater depth. This poem shows how a bullied child finds the right pathway to lead them into the light and away from the trouble. This book is just packed full of stories like these that not only tell a tale, but give us advice. They are there as guidance to show that there is a way to stand up to bullies and a way to overcome them. The authors in the book are all American YA authors, but many are well known in the UK too, so I don't think that affects our enjoyment at all of this book. It is one of those books that you can dip in and out of as you feel the need. At the back of the book there are resources for teenagers and parents to help with bullying. Alas these are organisations directed at Americans, but they have online sites which may help people in the UK. As I mentioned before, this is a book that should be on every school's book shelf and it should definitely be one that all children should read. This sounds wonderful, and I particularly like the sound of the Michelle Zink story you highlighted. I think I need to get this book. Thanks for the great review! Luisa - you will really enjoy it, especially as I know your children are of a similar age to mine. Michelle - thank you so much for taking the time to comment on my blog today. Your story truly inspired me and my girls. I am so pleased to hear that your daughter has emerged happy and confident. Wow that review is absolutely brilliant. I really have got to get this book to the top of my tbr pile. Emma - thank hun. It is a fabulous book to dip in and out of. This sounds like such a good book. My eldest is experiencing what I term bullying but it's within her close knit group of friends because she stood up to them and told the truth in a situation that happened. It's hard. Very hard to see them upset especially when it is so called friends (I tell her they are NOT friends but...) causing the upset. Wow. Definitely a must-read. Thank you so much for bringing this to my attention, Vivienne. So many of the stories sound familiar. Middle School was by far the most dreadful time of my life. the kind of book that i'm sure would benefit many people. Perhaps a good idea for a school library. Carmen - close friends can be the worst. They often know too much about you to use as ammunition. I hope she sorts it soon. Nymeth - It breaks your heart reading it, especially if you have lived through similar situations. Petty Witter - most definitely one for the library. Kudos for all of the authors who contributed to this book. I hope it helps many children through difficult times. I think some children hesitate to tell adults about bullying because the adults often make things worse. This sounds like a fantastic and important book! I can totally empathize with what your girls are going through. I would never ever head back to high school and endure all of that again and I'm certainly not looking forward to it for my kids. It's terrible how cruel people can be. Thanks for bringing this one to our attention! I've read some really good stuff about this book, and I think it sounds like a very important book. I'm still debating with myself whether I could read it or not, my own experiences still feel too raw 10-15 years on. I also love that someone compiled and edited this book. So important and it's so good to know that there is a book out there that can help kids deal with this. This is an amazing collection of stories, and I loved that they included stories of hope and kindness in with those that were sad. This sounds like such and important book.I'm so happy that authors give their voice to all those out there who is being bullied every day. I have to add that you're girls are lucky to have a mum like you. Sadly so many children out there don't feel like they can talk to their parents. I hope things work out for both of your girls, being bullied is a terrible thing! This sounds so good!!! I still remember my moments with a bully when I was young. Bermudaonion - totally right. I have to watch what I say and how I deal with the issues with my girls as I always worry I am making the situation worse. Trish - It is heartbreaking isn't it. Especially when you have experienced it yourself, you cannot help but fear for your own children. Jenni - I don't think any of us forget the way we were treated then. I only hope it helps us to build a stronger person for the future. Aarti - thank you. This is definitely a book that needs to reach its audience and fast. If it can help just one child then they have done a miraculous thing. Alyce - yes, it was fantastic that these stories didn't just tell them how bad things got but helped to show that these issues can be dealt with and there is light at the end of the tunnel. Mari - I think by using real authors who understand the YA generation, they are directly hitting the market they need to reach. Kids will listen to the people they look up to. It is sad that many don't feel they have anyone to talk too. Our girls are lucky and there school also has a student support area where there are adults who are not teachers available to talk too. Sheila - I think these memories stay with all of us. What a wonderful book! I am one of the fortunate ones never to have to experience being bullied. I certainly do not bully others as well. Im so sorry to hear about your girls Viv, I hope they are feeling better and they are more settled now. L was bullied a bit early this year and I felt so bad, we tried helping him as much as we could but its so hard! I really want to read this book and I definitely think its one every school library should hold.